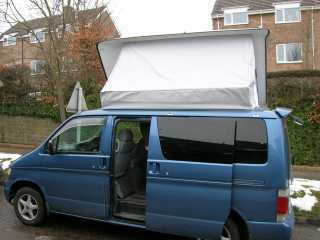 For many months rumour on the Bongo Forum had it that Japanese Auto Locators (JAL) had, after a few prototypes, finally managed to develop a push up roof for the Bongo. Member Nick Collier doesn’t live too far from me in Derbyshire, so I popped round to take a look. What the team at JAL have done is completely remove the roof from a tin-top Bongo, and then install a fibre glass (or is it Glass Replacement Plastic?) replacement. This is moulded from an original Auto Free Top as seen on Bongos with elevating roofs. The roof hinges from the driver side, and is secured in transit by 3 clips, 2 along the passenger side, and one above the passenger side of the windscreen. Once the clips are undone, and an internal strap is unfastened, it is just a case of pushing the roof to an upright position. Telescopic struts hold the roof in place. Inside, the floor of the roof-space comprises of 3 removable boards. Once up in the roof, in my opinion it is more spacious and less claustrophobic than the standard AFT, mainly because there is much more headroom. Which puts to bed all those old jokes about there not being “mushroom” up there! JAL have said that this is very much “work in progress” and further refinements are being added all the time. I can understand why Nick is chuffed to bits with his new purchase! JAL have now completed the work on internal hinges, and some photos are shown below. (Further update 20 October 2009): JAL have now added a side pole and catch for quick & easy opening, and new hinge covers that are colour coded to each individual Bongo. These are available as a retro fitting for all existing mushroom roofs.